I’m fairly confident that most of you actually know what tambour is, but you may not realize it. Read on to find out what it is, and why you may – or may not – want it in your home. Tambour is a type of door constructed from thin strips of wood mounted to a flexible backing. This type of construction allows the door to be rolled out of the way instead of swinging open. 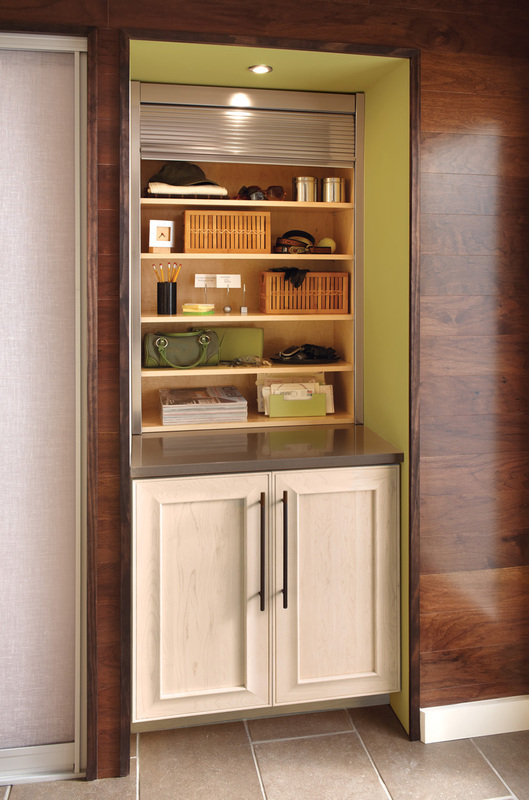 Often, tambour doors are installed in the kitchen appliance garages of old, such as the wood one seen below from Rockler. I don’t find that too many clients still love appliance garages, but the option is still available. For many people, tambour seems to be a love-it or hate-it proposition. Tambour does have some advantages over standard cabinet doors. 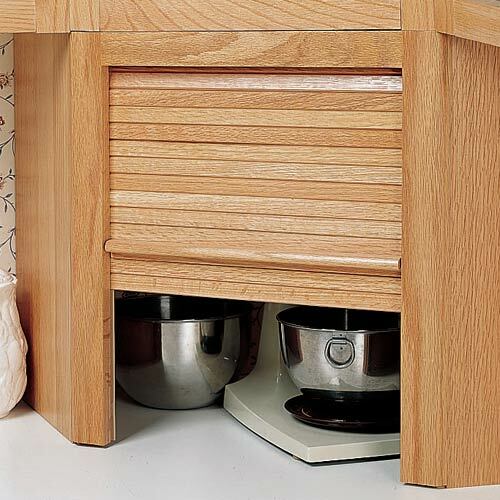 For one, it allows full access to a cabinet, since it rolls up and out of the way. It also allows you to add a door to a cabinet in a tight space – where you may not have room for a door to swing into the room. On the down side, tambour is notoriously difficult to operate. While good-quality tambour doors operate smoothly, some less-expensive models get stuck and become a headache for the homeowner. If you like the idea of tambour, be sure to select a manufacturer who makes a quality product and test it out ahead of time if at all possible. Another negative aspect of tambour is the look. Since tambour was most popular 30+ years ago, it tends to make even the most modern kitchen look a bit dated. However, newer tambour options, like this aluminum door from KraftMaid cabinetry, have a modern, industrial aesthetic that can be appealing in many homes. As I said, I’m sure most of you know what tambour is – you just may not have had a name for it. Now you do. Pocket Doors: Yay or Nay?